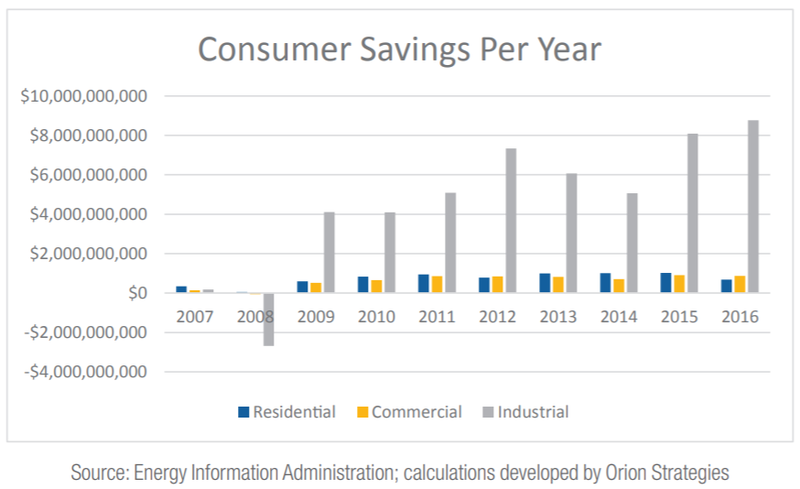 CEA found that residential consumers saw more than $7.2 billion in savings, while industrial and commercial consumers saved nearly $52.4 billion combined. The CEA report also detailed additional benefits the state has seen as a result of its record-shattering oil and natural gas production, including employing about 228,600 people in “direct upstream oil and gas jobs,” adding roughly $3 billion to Texas’ budget in 2017, and a projected $6.7 billion in tax collections for the 2018-2019 biennium. This most recent CEA report comes on the heels of three previous reports from the organization that found the Appalachian Basin states of Ohio, Pennsylvania and West Virginia, combined, saved more than $80 billion during this time period, and was released on the same day as a separate CEA report finding that Colorado’s consumers saved nearly $12.4 billion over the decade.